Nick Kraus, of Menomonee Falls and Sister Bay, WI, scored a 3 round total of 108 to claim the championship trophy, $2000 cash prize and the Red Jacket. All six members of the Kraus family have played in the tournament for several years. Nick, age 17, is the first to bring home a First Place Trophy! 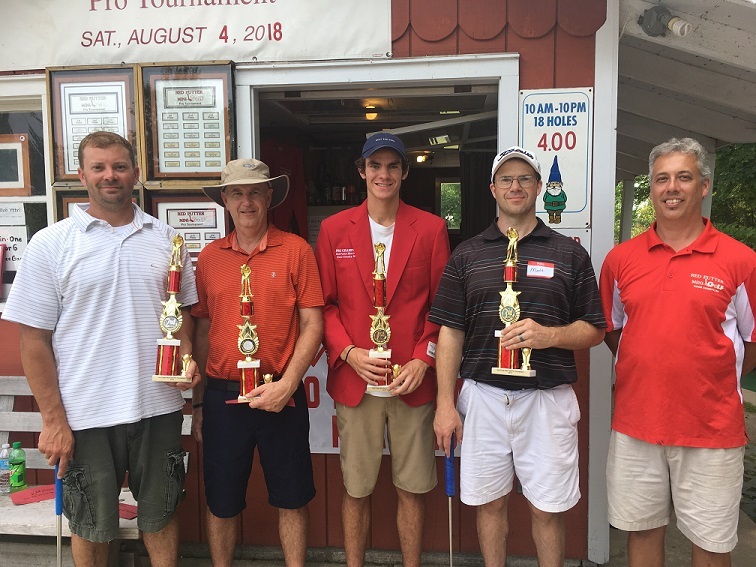 The tournament was held at the Red Putter Mini Golf in Ephraim, Wisconsin, USA on August 4th. The next three players were tied with a score of 109. After an intense playoff, Paul Nelson, of Fish Creek, took home the second place trophy by acing hole 3, the Badger. Matthew McCaslin narrowly beat out Gary Hester for the third place trophy. Last year's champion James Sullivan was just behind the pack at 110. Tim Tally had the best single round of 32. Next year's tournament will be held on Saturday, August 3rd, 2019. Players can now qualify for next year's tournament, by shooting under par on the course. Several have already qualified and have their names on the Red Putter Pro Board! Thank you to the Red Putter for providing these results.